Marsh landscapes have been one of my favorite subjects for many years. There is a stillness and serenity that touches me deeply. 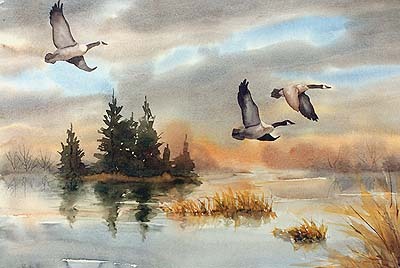 This watercolor is typical of an Ohio marsh, but could be anywhere. A man once told me he had hunted at this spot in Wisconsin. I used liquid frisket to mask out the birds before flowing in the wet-in-wet sky, allowing greater freedom with the broad washes. A standard palette of red, yellow and blue makes a good nature palette for a scene such as this. The standard palette is featured on pp. 62-63 of Exploring Color.